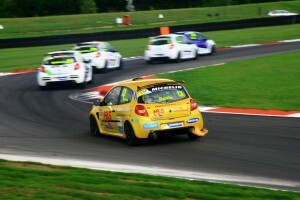 Ben Davis recently had his first car debut in the 2014 Michelin Clio Cup Series at Snetterton and is now coming back for more this season under the #RacingforHeroes banner and the Finesse Motorosport team. The high-profile charity initiative #RacingforHeroes will spread its presence to the 2015 Michelin Clio Cup Race Series, with talented rookie Ben Davis, to fly the flag for Help for Heroes as part of the newly created #R4H Academy. 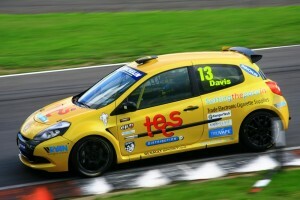 Davis, based in Abingdon, made a stunning car racing debut in the Clio Cup Series last August, during a one-off appearance, finishing seventh and fifth overall in the two races he contested, winning the Sports Class in each encounter. His sparkling debut provided the springboard to ultimately become involved with #RacingforHeroes. 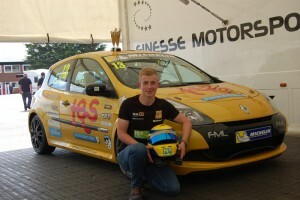 He is now set to embark on a planned full season under the banner RacingforHeroes with top team Finesse Motorsport Ltd (FML) – using Jake Giddings’ ex-third generation Clio. The 22-year-old, who originally made a name for himself in Superkart racing, boosts the line-up at Finesse to an impressive four cars. Davis joins race series podium finisher Pete Bennett (Norwich), category race winner Andy Jordan (Bridgnorth) and rookie racer Adam Hatfield (Cranworth). “I am absolutely delighted and honoured to be involved with such a great cause in #RacingforHeroes”, said Davis, “This is an amazing opportunity to progress my racing career towards the TOCA package and to be doing so whilst supporting our Heroes is incredible. Peter Thorpe – (founder of #RacingforHeroes) approached me after Snetterton last year and we’ve been in contact since then. While Davis does intend to contest the complete Michelin Clio Cup Race Series championship this year, he is still working hard to finalise a full budget for the current campaign which begins on 11th/12th April. This association to the charity and the ability to offer sponsors direct access to the TOCA #RacingforHeroes team offers an edge to attract financial investment to compete. Ben has the “natural winning ability” to be a future star, and I hope with our support he can truly take the fight to the front of the grid and battle for P1 in 2015. You can follow Davis’ progress throughout the season on twitter @BenDavisRacing.